Hi everyone, I'm excited to share these cookies with you! They're not exactly the most autumnal cookies ever, but they ARE delicious and who ever said you can only have pumpkin pie in the fall anyway? I don't know either so here's a delicious recipe for you to enjoy all year round! 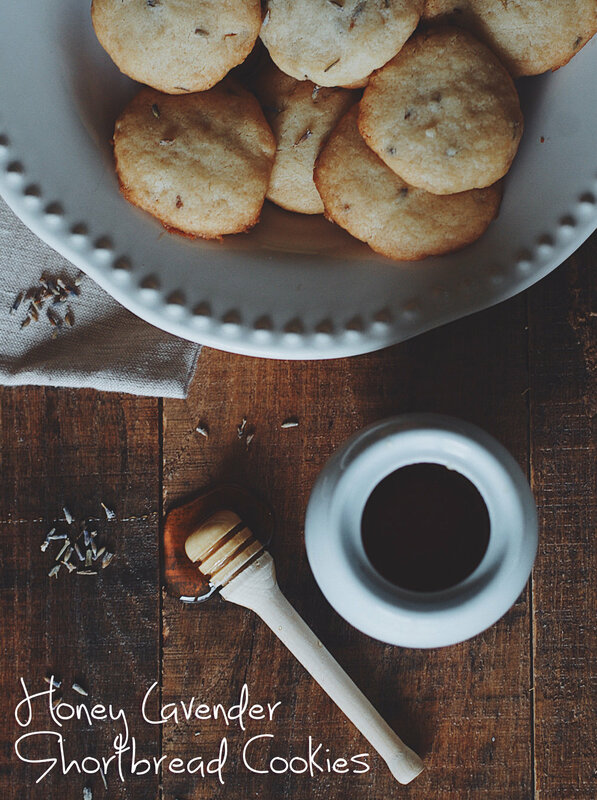 Flour, sugar, honey, butter, salt, lavender. Just six simple ingredients to make a tasty treat! But how much of each? Mix softened butter, sugar, and honey in a large bowl. Add flour and salt and mix with mixer again. Next, add lavender and mix in with spoon so to not destroy the lavender flowers with the mixer. Also, if you haven't made cookies like this, don't worry - it's not creamy. It will look clumpy until you knead it all together with your heads. I guess that was the next step :) After you get your mix into a ball, place in freezer for a half hour. Preheat your oven to 325 and when it's ready, pull out your cookie dough and make balls about 1" in diameter and then flatten with your hands to make a circle. You can use cookie cutters if you like a more shaped, polished look to the cookie. Place them in lightly greased parchment paper on a cookie sheet; leaving about a half inch to an inch distance between cookies. When you're all done, place in the oven for about 15-20 minutes until lovely golden brown. You can eat warm but they'll be a lot gooier than if you let them completely cool and refrigerate. Either way it's completely enjoyable and lovely! I hope you all enjoy making these sweet and delicious little cookies! These cookies were my own take on a recipe from The Baker Upstairs.